I mentioned on another page how the indoctrination of children begins with their first religious teaching, and nothing exemplifies this more so than the following picture. There is no difference between what Aravindan Balakrishnan did to his “followers” of his Maoist cult and what ISIS are doing to the young boys in the bottom image. 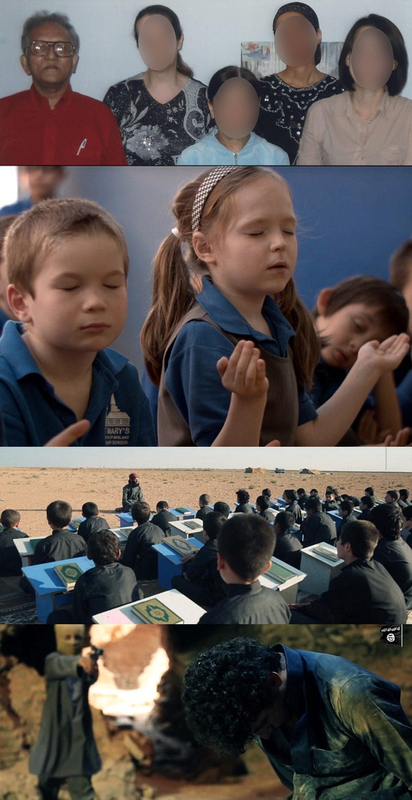 And the children in the Christian faith being “taught” how to pray, recently in the news due to the Christian advert being banned by the cinema chain (and rightly so). Each action is an act of indoctrination on impressionable minds. It doesn’t matter whether it’s Jesus, Mohammed or Balakrishnan: the principles and methods are the same. Forcing young boys to read one book and memorise it is against human nature. Forcing children to pray to an imaginary god when they lack the brain capacity to question what they’re doing, is agains their human rights. When are we going to learn that religion in all its forms should not be welcome in schools and in the minds of young children?